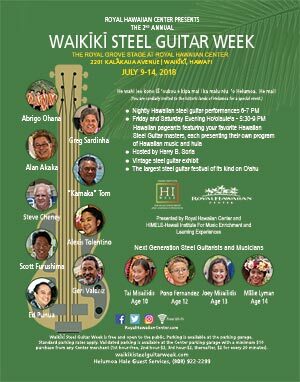 The Waikiki Steel Guitar Week, incorporating the Waikiki Steel Guitar Festival, is a week-long event celebrating Hawaiian music and the Hawaiian steel guitar. The annual event will be held at the Royal Hawaiian Center's Royal Grove stage during the week of July 15-20, 2019, immediately preceding the annual 'Ukulele Festival Hawaii. The scheduling of the festival provides opportunities for fans of either instrument to expand their music experience by participating in both events. Monday through Thursday evening concerts will feature one-hour performances by different Hawaiian steel guitar artists and ensembles. The festival's Friday and Saturday evening performance will feature various Hawaiian steel guitar artists and bands with different programs each evening. The event was presented free to the public by the Royal Hawaiian Center in association with the Hawaii Institute for Music Enrichment and Learning Experiences. This program was supported in part by the State Foundation on Culture and the Arts through appropriations from the Legislature of the State of Hawaii and by the National Endowment for the Arts.